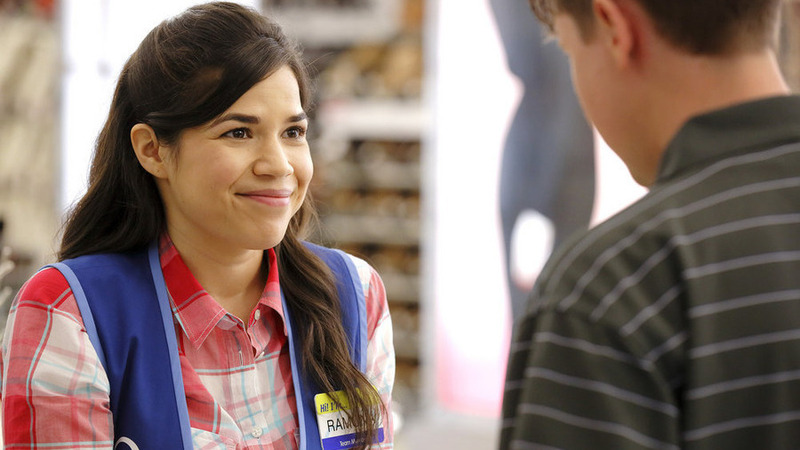 With 'Superstore,' America Ferrera Aims To 'Move The Dial' On Representation For the Latina actress, diversity in casting helped her new show broach difficult material. "This diversity gives us the opportunity to approach topics like race from a place of experience," she says. America Ferrera first gained attention from her role as the quirky, spirited Betty Suarez in ABC's Ugly Betty, a role that earned her a 2007 Emmy for outstanding lead actress in a comedy — a first for a Latina. Ferrera talked with NPR's Michel Martin about Latinos on television, diversity in casting, why she wasn't happy about Donald Trump's Saturday Night Live gig on her new home network — and what she plans to do about it. When I got the pilot script, I really responded to all of those things — the elements of dealing with real-life issues through the lens of comedy. And I think it's really time that we see another working-class comedy on network television. And our cast is so diverse. ... We all come from such different experiences of life, and what that does — it's not just about diversity for the sake of diversity. This diversity gives us the opportunity to approach topics like race from a place of experience. Not just from a place of intellectualism and having conversations, but about [being able to say,] "Hey, this is my experience, and it's messed up. And no one's right and no one's wrong." This is the first time that I had been offered a role that wasn't written specifically for a Latino actor. And all of these characters were written with no specified ethnicity. And usually what that means is, you cast white actors, because that's the default. But it wasn't like people saw Ugly Betty and thought, "Oh wow, there's opportunity here. There's so people starving and hungry to see themselves represented." It's amazing how hard it is to actually move the dial. And unfortunately, there's one big success and we all get super excited and it very rarely results in a watershed moment for Latinos on television. It's not as calculated, as planned as I would like it to be. Part of what I love so much about the work I do as an actor and as a producer is I believe in the power of media and art and storytelling to be a part of that conversation, and to really move those conversations forward. So, I don't think my voice is more entitled because I'm a celebrity, but I'm as entitled as anybody else in this country to use the platforms I have to talk about the things I care about. I was very uncomfortable with the decision and didn't agree with the decision. The truth is is that Donald Trump isn't going away. But I do think it's up to all of us to, yes, be angry but harness that energy where it matters and show up to vote on election day — and to use that anger that we feel when Donald Trump hosts SNL and organize our communities to show up where it really, really will make a difference.